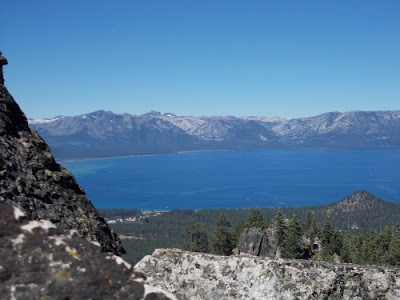 View of Lake Tahoe as I'm ascending Castle Rock. 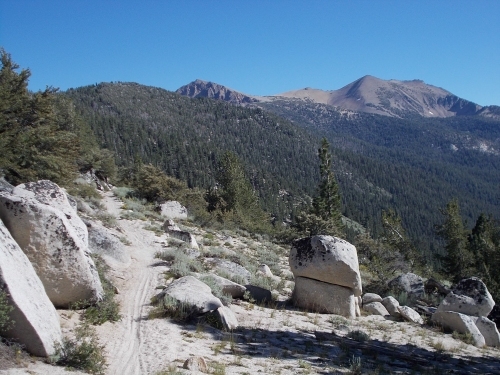 The next section of the Tahoe Rim Trail, from Kingsbury Grade to Big Meadow, was about 30 miles in length. The map of the section says its 23.2 miles, which doesn't sound so bad, but for me, it's actually closer to 30 because this map assumes I'd be starting from the Kingsbury South trailhead when, in fact, I'd have to start from Kingsbury North trailhead. The two trailheads are separated by about six or seven miles! Thus, I'd have to hike 6 or 7 miles to the Kingsbury South trailhead, or 30 miles to get to Big Meadow with the next major road crossing. 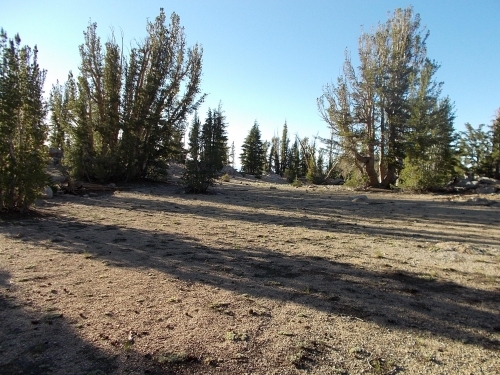 Kingsbury South was too short for a day hike, but Big Meadow was too far for a day hike. So Amanda and I decided to split up. I'd backpack this section over two days--about 15 miles per day--and Amanda would drive off to sightsee and explore the Lake Tahoe area, probably including a drive around the lake. 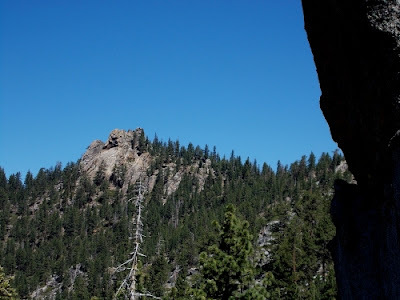 So she dropped me off at the Kingsbury North trailhead at about 10:00 that morning with my full arsenal of backpacking gear. No slackpacking it today! And I started down the trail. Those tall buildings on the left are the casinos in Stateline. 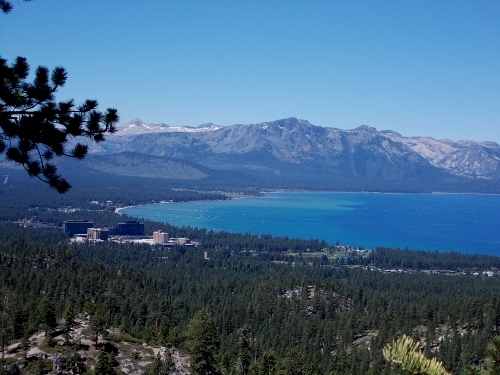 of South Lake Tahoe is on the California side of the border. Fortunately, my pack was safe and sound. I picked it up and continued the hike. 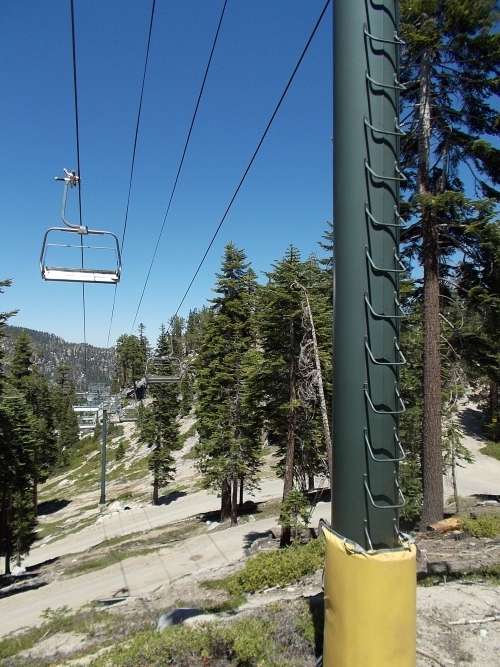 The trail wound its way through the Heavenly ski area, and became much drier. The west side of Lake Tahoe gets a lot more rain and snow on the east side due to the rain shadow effect, and you could definitely see the difference in this section of the trail. 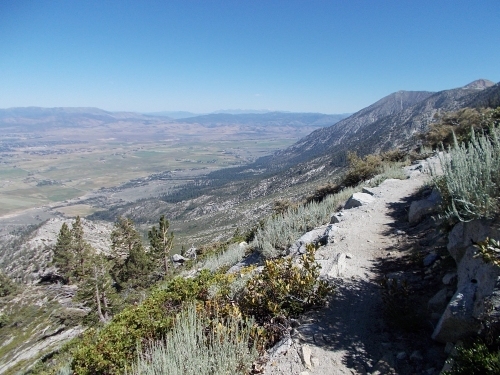 It also opened up to incredible views eastward towards the Carson Valley. 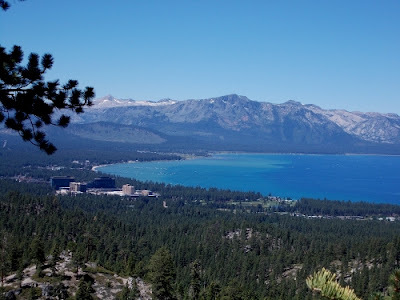 It was an interesting sensation, to look west and see that giant puddle of water known as Lake Tahoe surrounded by green mountains, then walk over to the other side of the rim and look westward to a complete lack of water and trees as far as the eye could see. Which might not sound pretty, but it held a certain kind of beauty in its own special way. I saw all of about 5 people on the trail today, none of which appeared to be backpacking, and all of which were near trailheads. a photo of in this photo. That's Castle Rock in the background. 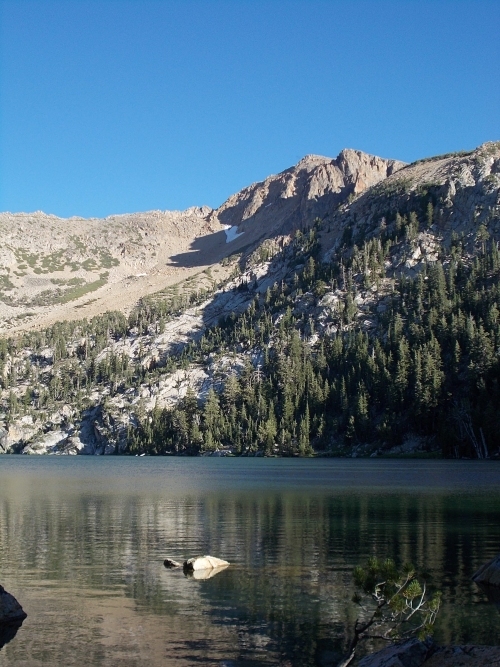 My goal for the day was to reach, at a minimum, Star Lake, which would be the approximate halfway point for the trail and the only reliable source of water I knew about. I arrived late in the afternoon, a little after 6:00, but being the height of summer, I figured I still had a couple of hours of daylight left. I said I'd meet Amanda at around noon the next day, and doing the math in my head, it would be a difficult point to reach by noon if I actually stopped at Star Lake for the night, so I filled up with water and pushed onward. My map showed a Willow Creek a mile or two up ahead where the steep contour lines of my topo map spread out suggesting a relatively flat area. I could probably find somewhere to camp there and maybe the creek even had water. If it didn't, that was fine, I would carry enough from Star Lake. I hoped there would be water, however, so I didn't have to worry about conserving it in camp. 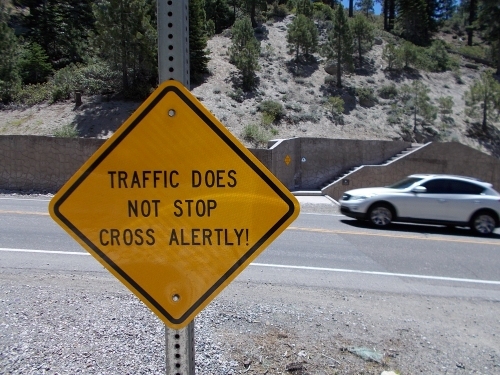 Crossing Kingsbury Grade. Watch out for traffic! I quickly set up camp and dumped out the water I carried from Star Lake replacing it with the water in Willow Creek. I figured people probably liked to swim in Star Lake, and probably camped around it more often making that water more likely to be polluted. 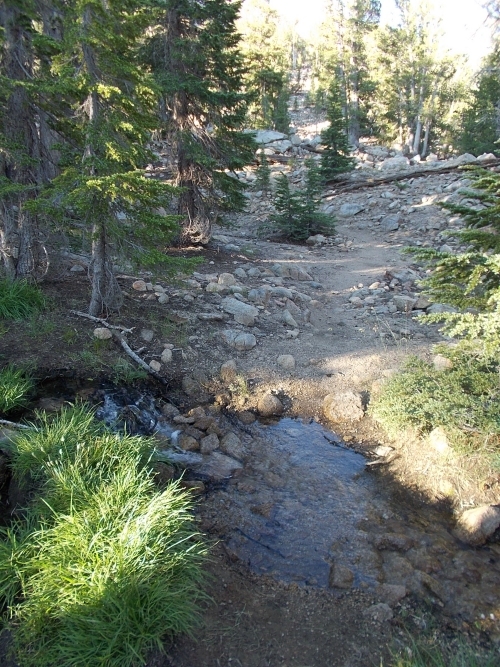 The Willow Creek water looked fresh from the mountain snow with less opportunity to have been polluted. Which is even more important to me since I don't filter my water. I'd have used the Star Lake water, and it would probably be fine, but if you can replace one water source with a better one, you'd be a fool not to. Even if you had a filter! I went to sleep under beautiful, clear skies. The nearly-full moon drowned out all but the brightest stars, at least until it set far after midnight. Once the moon set, though, the stars lit up like diamonds, twinkling and dancing until dawn. Passing through the Heavenly ski resort area. 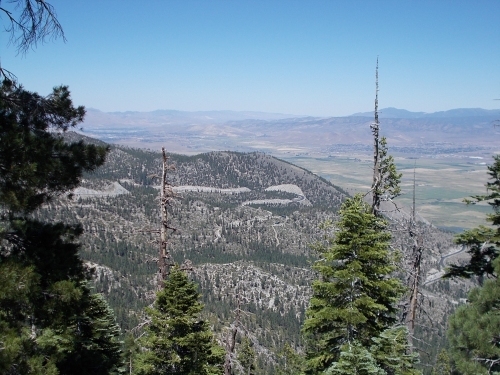 Looking eastwards towards the Carson Valley is much drier and has a lot fewer trees. in a very different way than those westward-facing views! Star Lake is just under one of those mountaintops ahead... but which one?! 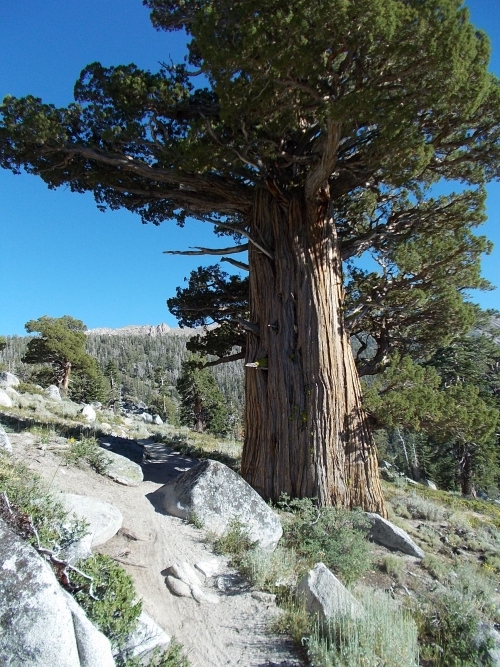 some of the trees on this section are the largest you'll see on the TRT! I know you don't filter your water but do you use purification tablets? And Boy Scout wisdom he'll decline. And ruin a peaceful hiking day. A, the pressure t publish or perish...The second to last line should read, "A bloody, liquid stool induce"